The Feminist Judgment Project (FJP), a collaboration of feminist legal scholars writing feminist judgments that formed the basis of the book, was inspired by a similar project in Canada, the Women’s Court of Canada (WCC). The WCC consists of a number of Canadian feminist legal scholars, activists and litigators who assembled in order to rewrite the Canadian Charter of Rights and Freedoms equality jurisprudence. The FJP is unique, however, both in being based on English law, and in addressing a far more extensive range of cases than the WCC’s focus on substantive equality. Indeed, the cases that the FJP tackles comprise issues on parenting, property and markets, criminal law and evidence, public law, and equality. The judgments also remain true to the historical context of the cases, and are written as if they occurred on the same date of the original judgment. Specifically, the FJP is confined to cases decided by courts in England and Wales. The volume contains twenty-three judgments, six of them written jointly by two authors. Each judgment is preceded by a commentary which summarizes the original decision in each case, and explains and engages with how the feminist judgment differs from the original decisions. In so doing, the book aims to widen the scope of its audience beyond legal scholars and professionals. 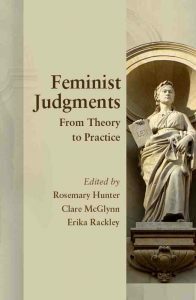 The theoretical underpinnings of the FJP are threefold: to challenge the notion that judgment-writing is or ought to be confined to judges (it thus seeks to develop the practice of writing judgments as a form of critical scholarship); to advocate that feminist judges can make a difference; and to critically interrogate the way in which law constructs gender. Further, the feminist theoretical frameworks that buttress the FJP, although diverse, share in common the desire to destabilise the presuppositions of liberal legalism. This is variously pursued in the judgments in five ways. First, by emphasizing a “feminine” ethic of care, and thus acknowledging the associated webs of relationships in which individuals are embedded, rather than subscribing to “masculine” notions of separate, atomized individuals. Second, by undermining misguided dichotomies such as autonomy and agency on the one hand, and vulnerability and victimhood on the other, and instead acknowledging that individuals can occupy both positions at once. Third, by undermining the public/private divide, in which men have dominated the public realm whilst women have been relegated to the private (domestic) realm, and which has thus perpetuated unequal power relations. Fourth, through the critique of rights discourse (which, in spite of their value, can also lead to rights competing with each other); and fifth, through an exploration of how the notion of formal equality, generally critiqued and repudiated in favour of substantive equality by feminists, does effectively hold some value. In addition to these strands, some of the judgments also draw on Foucauldian arguments about the bio-power of the human sciences replacing juridical power, the effects of normalizing discourses as mechanisms of control, and the power/knowledge nexus. Indeed, the law often defers to “experts” (such as medical experts), in order to obtain professional knowledge that may be converted into a legal principle, and as a consequence, such expert knowledge can play a determining factor in the outcome of a judgment. Some of the cases for which alternative feminist judgments are written are thought-provoking and even unsettling, not only in their facts, but also with regards to the original decisions and the ensuing feminist judgments. This review will explore three cases in particular, and offer an idea of the kinds of rich debates that the book is capable of generating. The first case is from the “Parenting” part of the book (Part II), is that of Re (A) Conjoined Twins (for legal purposes known as “Jodie” and “Mary”). The case involved the eventual decision by the Court of Appeal (which coincided with the preceding outcome by the High Court) to separate the conjoined twins Mary and Jodie in order to save Jodie (who was supporting Mary with her heart and lungs ). The feminist judgment is an example of the repudiation of expert knowledge and the embracing, amongst other considerations, of parental wishes as to what constitutes the “best interests” of the child/children. Geraldine Hastings offers a reconceptualization of the conjoined twins that views their togetherness as inherent to their existence and as fundamentally constitutive of their identity. In Hastings’ feminist judgment, the parents’ wishes are respected and their appeal is upheld; the surgical separation is not to take place. The first point of difficulty that arises is in Hastings presuming a “potential bond, both physical and emotional” (141) between the sisters. Yet, with regard to how Jodie might actually feel about Mary, Hastings argues that “We (particularly as non-conjoined adults) cannot assume what most children would want or feel, let alone what conjoined twins themselves would want – what Mary and Jodie would want and what they would say if they were able” (141). The explicit contradiction in Hastings’ reasoning is the first crack in her judgment. Hastings’ judgment also downplays the most pertinent aspect of the twins’ conjointness: without surgical separation, both twins would eventually most likely die (the medical evidence estimated within six months to two years) by virtue of their conjoined state. An emergency, rather than an elective separation, also held a much diminished chance of survival for Jodie. Hastings, in an archetypal rejection of Foucauldian expert knowledge, dismisses the medical evidence indicating Jodie and Marie’s chances of survival if they remained conjoined as insufficiently conclusive. Their predicted shorter life span as conjoined twins is also trivialized. As Hastings argues, “I doubt the necessity to separate these babies when there is the possibility of two connected and interdependent lives, even if for an apparently shorter life span.” (143). As a consequence, the credibility and feasibility of Hastings’ feminist judgment is significantly undermined. The Royal Bank of Scotland v Etridge (No 2) and other appeals feminist judgment, from the “Property and Markets” section of the book (Part III), reads as an effective critique of unbridled neo-liberal financial capitalism as well as a feminist piece. As Auchmuty’s judgment argues, “If these cases tell us anything, it is that lenders are too careless in the dispensing of their funds to businesses.”(158). Etridge (No 2) involved eight conjoined appeals of wives who had charged their interest in their homes in favour of a bank as a security for their husbands’ indebtedness or the indebtedness of a company through which the husbands conducted business. In seven of those appeals the bank sought to enforce the charge against the wife, and in the eighth appeal the wife brought a claim of negligence against the solicitor who had advised her prior to her signing the guarantee. All of the wives claimed the undue influence of their husbands had led them to sign their respective agreements to stand as surety for their husbands’ debts. In one of the most interesting parts of her judgment, Auchmuty socially, culturally and historically situates Mrs. Etridge in particular, and in so doing ingeniously re-appropriates the public/private dichotomy, notoriously a bone of contention for feminists, to reinforce Mrs Etridge’s appeal (with her home constituting her private domain and dominion, especially in consideration of her personal history). As Alison Diduck’s commentary states, “Home, as Achmuty says, is women’s territory, even for women who work outside it.” (153) Auchmuty’s argument seems to be confined specifically to Mrs. Etridge’s circumstances, and thus does not purport to make universal, ahistorical claims about women and domesticity being necessarily correlated. Nonetheless, such interpretations are possible and likely to provoke the ire of feminists who repudiate connotations of women’s place fundamentally being in the home. However, not only does Auchumty’s judgment seem to be explicitly restricted to Mrs. Etridge and her specific history, in which such connotations were the norm; it also (whether or not Auchmuty originally intended it) effectively operates at the level of a Foucauldian “reverse” discourse (Foucault 1998, 101), in which a dominant discourse is re-appropriated and utilized as a source of empowerment by those previously oppressed by it (Foucault cites the famous example of homosexuality as a type of reverse discourse). Another fascinating case and consequent feminist judgment is the House of Lords case of Roberts v Hopwood, from the “Equality” section of the book (Part VI). The 1925 case involved the district auditor challenging the administrative law decision by Poplar Borough Council to pay a higher minimum wage to its employees than had been formally agreed through official negotiations with the trade unions, and to pay male and female employees at the same rate. Indeed, “In 1923, the district auditor considered that the minimum wage paid in Poplar was excessive and unreasonable.”(381). The district auditor succeeded at the House of Lords with regards to a surcharge to the members of Poplar Borough Council to the sum of £5,000, the amount by which the district auditor thought the wages exceeded what he thought was reasonable. Both the commentary and the feminist judgment to the case are richly detailed and effectively contextualize the reader within the historical, social, cultural, and political setting of 1920’s Poplar in the East End of London. The setting is one which is imbued with Labour (Labour had won a majority in the borough council elections in 1919) and feminist politics, as of the four aldermen appointed after the elections, two were women, who had also been actively involved in either feminist organizations or the Suffragette movement. The case is a pertinent example of the courts failing to protect the interests of the working-classes and women, and also highlights one of the weaknesses of the common law, which was much more pronounced prior to the Human Rights Act of 1998, with regards to discrimination. As Stephanie Palmer argues in the commentary, “The common law never developed a concept of unlawful discrimination.”(384). By bringing the decision-making squarely back in the hands of the elected Councillors over the unelected Judicial Committee of the House of Lords, Harriet Samuels’ judgment undermines commercial interests in favour of principles of social justice. In the ensuing passages, her judgment also explicitly challenges Lord Atkinson’s unequivocal disdain in the original decision towards feminist lobbying (and towards feminists generally) to enforce the equality of the sexes in the labour market. Thus, Samuels’ judgment as a whole reads as a powerful socialist, as well as feminist and human rights piece. The three cases that have been explored so far are just a small sample of the incredible cases contained in the book, and allude to the actual breadth of the subject-matter of the remaining twenty cases, and consequent feminist judgments, that populate its pages. The book does not just live up to its promise to provide judgments that are openly feminist and concerned with women’s lives, but also tackles issues of economic and social justice, and issues that affect, amongst others, the black and minority ethnic (BME) and the lesbian, gay, bisexual and transsexual (LGBT) communities. Consequently, the book as a whole draws attention to the discrepancies in judgments that can arise due to a lack of judicial diversity (the Supreme Court of the UK has only one woman, Baroness Hale, on the bench. There are no members from the BME community) and which do not accurately reflect and represent the diversity of society as a whole. This ultimately renders the book considerably useful and valuable, regardless of whether or not one agrees with any of the feminist judgments.